Sakata Eio (坂田 栄男, Sakata Eiju, Honinbo Eiju, 'razor-sharp' Sakata, b. 15 February 1920 - d. 21 October 2010) was a 9-dan, Japanese, professional player. He is known for holding a former record of 64-title wins; his dominance of Japanese go through the 1960s; being the first Japanese professional to reach 1,000-career-wins; and publishing several popular go books. He was called, the Inventor of Myoshu by Go Seigen and nicknamed, 'razor-sharp' Sakata due to his fierce and brilliant moves during complex fights. He is considered one of the strongest players of the 20th century and, by many, one of the strongest players of all time. His teacher was Masubuchi Tatsuko 6-dan. Cho Chikun 9-dan: Sakata played a very ordinary opening. He never schemed for an advantage there. It was when the stones started to become entangled that he displayed his true power. That was when he would start to read deeply, then read some more, and then still more. Therefore, it was natural that he often discovered exquisite moves during those times. Reading was his most deadly weapon, so concepts like 'the shape of stones' or 'positional judgement' did not even come into consideration. If he could exercise his reading skill anything was possible; by always searching for the best move there was no need to make a judgement about the position. Sakata's special strength lay in his determination to always keep the pressure on, not matter how much of an advantage he might enjoy. Like Go Seigen, Sakata played a dodging, amorphous type of game, so it was natural that they both often traded territory on a large scale (furikawari). But whereas Go traded groups based on his intuitive appraisal of the situation, Sakata would do so based on the outcome of his reading. There is a great difference between the two styles. Sakata clearly also plays flexible go, but it differs from the flexibility of Shuwa and Go Seigen. In contrast to the latter's 'intuitive flexi­bility', Sakata's flexibility is based on his analyti­cal ability. He is perhaps the type who will try anything if he decides it can be read out. This is the difference between the analytical player and the intuitive player. Perhaps the thing I recall most vividly from my own encounters with him was the vivid energy in the moves he made. Sakata Eio 9-dan: My strong point was always my play in the middle game. I would not try to come up with stunning moves in the opening but merely bide my time until that phase was over with. The more complicated the position become the greater my confidence in my ultimate victory. Even today when I look back on myself during my best years it seems to me that I played a truly powerful game. Takagawa Kaku 9-dan: With Sakata intuition played the most important role during a game. Most players, including myself, analyze the overall position and decide on our moves as a result of this comprehensive overview, but for Sakata his first impression of the layout of the board was the most significant. Not only that but intuition was the essential part of his decision to 'play' a move. On an elementary level this philosophy of go is diametrically opposed to mine. I was always celebrated in a fashion for my endgame play while Sakata was not, but I think here he was terribly underestimated. His appraisal of the largest move on the board was always startling. I have rarely encountered anyone who could calculate the value of a move as well as he. But what startled me more than anything was the way he intuitively chose even his endgame plays. I would spend hours analyzing the final moves of the games only to find that Sakata, as usual, had outfoxed me. Sakata also played an ambitious, greedy kind of game. He was always intent on taking territory and as a result he often left weak stones scattered about the board. Yet he was unrivaled in his ability to make life for those stones (shinogi). It was simply splendid how he could create formations that defied analysis. Even top professionals like myself could not always determine if one or another of his groups could be killed or not. If one omits Go Seigen from the list he would have to be considered the strongest player of that era. Yamabe Toshiro 9-dan: Sakata's go can be summed up very easily: he possesses an unparalleled mastery of reading which allows him complete freedom to pursue any variation to its conclusion. Also, his skill in the middle game is incomparable, whether he is attacking, lightly sidestepping a blow or making eyes for an endangered group of stones. He displays a bewildering array of moves, counter-moves, feints, and thrusts. His play is fluid and lively, never static. It is when the position becomes most complex that he plays his best. 1943: 1st Three Crows Tournament? 1951: 1st Nihon Ki-in Highest Dans Tournament? 1961: 2nd Nihon Ki-in First Place Championship? This is a collection of various thematic, career statistics, such as against certain opponents, playing as a certain color, number of games where he used a 3-3 point, etc. Feel free to add your own theme. *Note: his best results come when he played most his games against an opponent in his prime. Many games against younger players were played after this period. Cho Chikun 35 15 20 0 42.9% First match 1973, last match 1994. Most losses after 1979. Fujisawa Hideyuki 75 47 26 2 64.4% First match 1951, last match 1989. Fujisawa Hosai 54 35 19 0 64.8% First match 1940, last match 1984. Go Seigen 43 17 25 1 40.5% First match 1934, last match 1976. Most wins after 1959. Hashimoto Utaro 60 34 26 2 58.6% First match 1939, last match 1982. Kitani Minoru 49 31 16 2 66.0% First match 1936, last match 1963. Miyashita Shuyo 41 27 14 2 65.9% First match 1938, last match 1973. Many wins after 1964. Otake Hideo 44 20 24 0 45.5% First match 1964, last match 1990. Rin Kaiho 87 37 50 0 42.5% First match 1961, last match 1992. Sugiuchi Masao 33 24 9 0 72.7% First match 1951, last match 1982. Takagawa Kaku 97 74 21 2 77.9% First match 1939, last match 1975. Takemiya Masaki 34 17 17 0 50.0% First match 1969, last match 1995. Yamabe Toshiro 26 16 10 0 61.5% First match 1959, last match 1981. Sakata Eio is author of many books in Japanese. His Sakata no Go series, aimed at dan players, is still in print after more than forty years. The Fiery Games of Master Sakata Eio is a collection of self-commented games and has been reprinted in various forms since its publication in 1991. Amongst his books translated into English are: Modern Joseki and Fuseki, The Middle Game of Go, Tesuji and Anti-Suji of Go and Killer of Go. Upon becoming Honinbo for the first time, Sakata chose the name Honinbo Eiju　(本因坊栄寿). In 1953, he beat Go Seigen in a Six Game Match, 4-1-1, taking a B-W-B handicap. 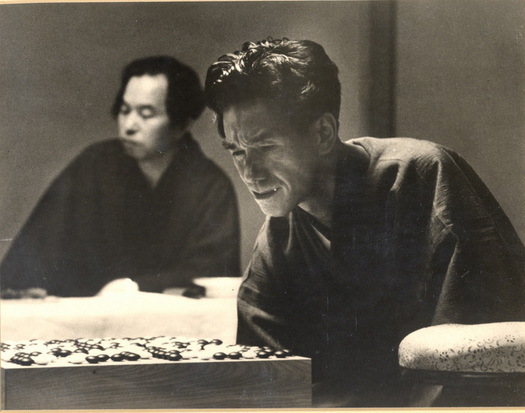 In 1964, Sakata became the first person to hold both the Meijin and the Honinbo titles simultaneously and won seven titles (with a game record of 29-2). Sakata set a record with 64-title-match wins. Among Japanese professionals, the record was held until Cho Chikun broke it between 1999-2000. Sakata played 1,787 official games, with a record of 1,117-wins, 654-loses, and 16-jigos. He was the first Japanese professional to reach 1,000-wins. He retired in 2000 at the age of 80. He passed away on 21 October, 2010 from an aortic tumor rupture in his chest. Up until the 1990s Sakata and Takagawa Kaku played more games against each other than any other rivals in Japanese tournament history: 97. Sakata led the series by the lopsided score of 74-wins, 21-losses, 1-jigo and 1 unclear result. Takagawa once remarked, "... if Sakata had never arrived on the scene I surely would have captured dozens more titles." The game shown in the famous profile image (see image above) is from the 22nd Honinbo Final, game 5, 1967-06-12 against Rin Kaiho. In 1990, at the age 70, Sakata narrowly missed challenging for the 45th Honinbo Final due to a special rule in the case of a multiple ties. He lost his game in the final round, against Rin Kaiho, putting his record at 5-2 and initiating a three-way tie. He would have become the oldest player to challenge for a big title. The Magnificent Obsession: Sakata Eio and Go, Go World Iss. 50 & 52. Go World Iss. 23, p. 26. A Champion for All Seasons: Takagawa Kaku, Go World Iss. 41 p. 24. The Magnificent Obsession: Sakata Eio and Go, a 54-page, two part article on Sakata's career and life in Go World Iss. 50 & 52.